Great news for Canadian gamers – the PlayStation Vita 3G/Wi-Fi model will be available in Canada on October 2nd. 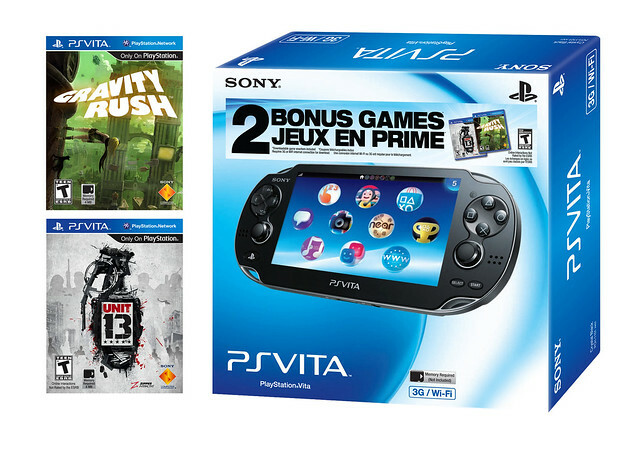 We’re putting together a great bundle to launch the 3G/Wi-Fi Vita. It includes a download voucher for two exclusive PS Vita games – Gravity Rush and Unit 13 – and will be on-sale for $299. Rogers data packages will be available on a month-to-month basis. The addition of 3G-network access is the perfect pairing for the gamer who wants convenience, community and connection on the go. PS Vita systems with an active Rogers data package can use software functionality developed specifically for the 3G-enabled model, including turn-based, asynchronous multiplayer gameplay, instantly updated rankings and leaderboards, immediate access to the latest downloadable add-on content, and real-time community news. How is it great news? I already bought a Vita because this one wasn’t released for nearly a year? If I want to upgrade I’ll trade it in and get what $100? Ok that’s one hell of a deal for newcomers, good job. Well, at least some of the future Vita bundles from SCEA will include a memory card like AC III: Liberation and CoD: Black Ops Declassified. It says “Memory Required (Not Included)” on the box if you look closely. fffffft… too late, now I’m stuck with the regular, Because I loved Sony and pre order that wifi vita, anyway…. Whatever causes you guys to take way, way to long to do stuff needs to end. 8 months for 3G Vita, 2+years for PSN cards and a video store etc. Seriously there’s no valid reason this stuff should take so long. Especially this one. No vaild excuse for not having this done for launch. Will it come with a memory stick? in order to actually download both of those games? also what is the plan like? It really is about time that at the VERY LEAST… every single PS Vita comes with a 4GB stick. At least the voucher is included. I remember getting burned with the US 3G Launch Bundle where you had to sign up for 3G before they mailed you the Stardust code. I love the system, but that really pissed me off. That’s right SCEC decided on a bundle that includes game(s) that require you purchase a memory card. Come on SCEC, you could have at least thrown in a 4gb card in there. Wait, they are download vouchers, not retail disks? Double holy crap, the box shows retail boxes for Unit 13 and Gravity Rush yet it’s download vouchers? Wow, this is a giant screw up. Hey Sony, you might want to change that ASAP. It should just be the games logo with some text above or below it that says “Download voucher” or something. I’m not Canadian, but if I were I’d prefer to have one game and a memory stick instead of two games and no memory at all. There should also be similar bundles that come with the Wi-Fi only version for cheaper (or the same price if they come with bonus items like memory sticks, screen protectors or those little silicone sleeves that come with the starter kit. -.- I wanted this when I went for a Vita on Feb 29th (had to wait a week after release). Now how Am I getting this.. ohh I know!! watch it building dust til they do clearance. Nice it comes with 2 games but it doesn’t have a memory card anyways to download onto. Which means the people who want vita the most will probably be the only real buyers of this. But they already got the WiFi only model. Sony needs to stop screwing Canada. That is my only problem with sony. Canada seems to always get dissed. SONY YOU FOOLS! Your handheld NEEDS the MEMORY CARDS to work out of the box with anything worth its retail price, why can’t you see it? why can’t you make a pack-in memory card STANDARD for all PS Vita bundles??? Who the heck is in charge of making the right decisions in that company because I swear that guy’s been absent for months and its collecting his salary doing NOTHING! Why would anyone complain about this? We finally have 3G Vita in Canada AND it comes with 2 FREE games!! Good job Sony!! Yes, every PS Vita should come packed with a memory card. I dare anyone to name another device in the market (PSP doesn’t count) whose business model is based on the user buying an incomplete machine. It should have been released with 16gb of internal memory minimum, to begin with. @Dinsouza the Original Xbox 360. I’m happy with my wifi PS Vita… besides, with iPhone 5 coming out soon, connecting the VITA to my future phone’s 4G Personal Hotspot feature will be a much better option. SONY,PROBALLY YOU WILL NOT READ AND GIVE AN AWNSER TO THIS QUESTION BUT ANYWAY; WHY YOU DONT RELEASE THE PS VITA 3G SISTEM ON SOUTHAMERICA?,AND YOU ONLY RELEASE IN EUROPE,U.S.A AND NOW IN CANADA?. IF ANYBODY CARES ABOUT SOUTHAMERICA AWNSER THIS QUESTION PLEASE. this is what vita newcomers needed from the beginning, i have a vita since day 1 but if it had this offer from the beginning people would have bought it and the vita would have sold more units. Like everyone else here im still upset that it wasn’t available when i got mine launch day. It’s great that it’s finally here though haha. Overall im happy with my Wifi model and 32 gig card. Not like there’s anything to do with the 3G anyway. I do agree though, this is the most misleading bundle ever. Shows the game cases on the box yet theres no games in there, just download codes for games you cant use without paying hilarious prices for a memory stick. Just read the box in full screen. It says downloadable, and then says no memory card. neat download codes for games and no memory cards to down load them to?? Ok I get it it a $$$ thing cool bundle…. I wouldn’t expect a response. SCEC normally does a post and run. I’m confused about this post, has the Vita not come out in Canada yet? That’s what the article makes it seem like. This is really something that should have been available on launch day. I understand that Canada is a much smaller market so SCEA doesn’t put anywhere near the effort into keeping Canadian customers happy as they do for the US, but still having the same stuff on the same day as the US would be nice and, at least for me, would make me think more of Sony rather than less. Also is it just me or is that packaging terrible? It’s like someone just did a cut and paste in Paint. They stickers that go over system boxes when retailers do packins(Like the Free Uncharted 1+2+3 Walmart is doing for their anniversary sale) look way better then this. Come on Sony, this is a standard bundle, you can make the package look nicer then that. Any idea when sony is going to allow sim unlock? Actually now that I look at it, that can’t be the actual box. It’s just a really quick photoshop someone put together. The “Memory required” text would be in both languages if it were an actual Canadian box. That is clearly a photoshopped US Box. This thing comes out in 3 weeks and you don’t have final box art? Really? Wish the 3G was out from day one in Canada, but I guess they couldn’t get the service provider until now. Anyways, my Wifi Vita is just fine. If I want 3G, I just tether it to my cell phone. Love my PS3 and PSV ! Yes, the Wifi Vita has been out in Canada since February this year. 3G hasn’t been available in Canada until now. Every PS Vita should come with a 4GB memory card Sony. Get it together. And drop the ludicrous prices on memory cards too. Those are obvious hurdles that you just keep slamming into, instead of jumping over them. And digital versions with no memory card is distasteful. Wow, didn’t realize Canada didn’t already have Vita! Thought everything gets released within a couple of days or weeks from each other territory wise. I’m curious as to know why such the late release! @39 We have Vita, just not the 3G model. Props on giving two good games at least. Sold mine today. Sony really missed the boat on the Vita; the tablet and smartphone industry is steam-rolling them and the forecast is unlikely to improve. They should have released a direct tablet competitor with controls. Period. That’s all that they needed to make a unique product and proposition in the market. Now Asus and a few others are making THAT EXACT DEVICE. Watch Sony copy such a model in like 2-3 years once the Vita has lingered on life support long enough. I still have my PS3 for the JRPGs and awesome titles in the pipeline, but I think this might be my last gen with Sony. They just don’t get it. @Christian399: A tablet with physical controls? Ugh, no thanks. If I did though, I’d just get a freaking Wii U.
I think this was pointed out, but can’t be set enough – no memory card. Makes this bundle more expensive than it first appears. Yeah I’m happy that we finally get a 3G version..however.. Rogers? No thank you. Now if I was allowed to choose who i wanted my 3G plan with then.. maybe I’d pick one up ..providing I didn’t have a Vita already. I’d rather not get screwed over by Rogers again thank you very much! Not to mention, I’m quite happy with my Wi Fi vita. First AT&T for USA and now Rogers for Can? Do you like ticking people off, Sony? :S Is the price going to be just as ridiculous for monthly packages? You can keep it. I’m happy with my wifi only model. does the data plan have to be with rogers? @46, I would take Rogers over bell any day of the week. With Bell I can’t even get 1 bar of service at my house, with Rogers I get full coverage! Also, general question, will I be able to pre order this at my local EB Games soon?